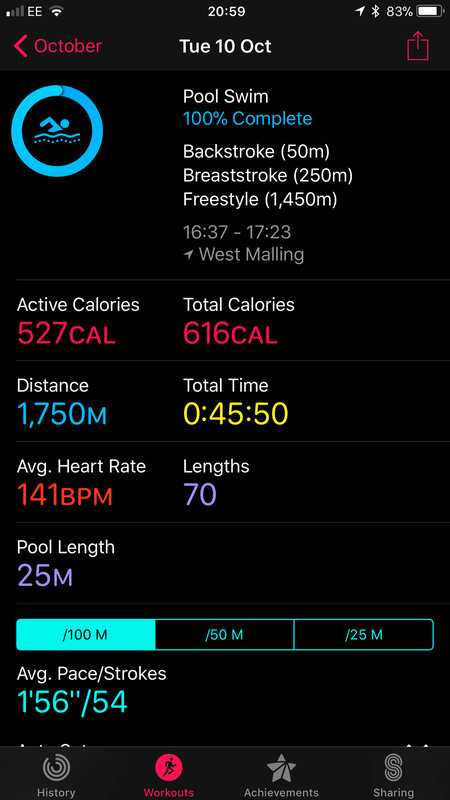 You can't create a swimming session in the Workout app, so you'll need to a) memorise it, b) print it out and put it in a waterproof bag. c) use some sort of watch app that you can write notes with and add your session to it, or d) have a coach shout it at you. I thought I'd use c) with an app called AnyList which sort of works, but in the end I just used a) and remembered what I was doing. The Workout app isn't the most sophisticated in what it can display during the swim (all the magic happens afterwards in terms of the data breakdown) so you only have a total of seven fields as shown here to chose from. Note there is no current pace, so if you have a target CSS rather than RPE to aim for you are out of luck with this app. You do have Heart Rate though 😁. I had average pace, distance, and heart rate displayed, but I only really checked distance during the swim (which was clear enough to check on a turn) and at the end of a set. This is one area that I am expecting other apps to improve on. At the end of the session, I noticed that the watch had recorded 1750m rather than 1800m and that the average pace looked quite slow. This was because of the 50m kick drill. As noted in my previous post there is no way to tell the Workout app you are doing a drill, and if you aren't moving your arms the accelerometer doesn't measure anything, and so it is assume you are having a rest (!). The rest of the summary on the watch was fairly basic, just showing average HR, total distance etc. However once I opened the workout on the iPhone the full detail was displayed. This provides a very nice detailed breakdown of the swim and the Auto-Sets have worked perfectly, matching the strokes and sets to what I actually swam (with the exception of the legs drill as noted above). I noted that the average pace had now been corrected to what I would expect compared to what I had seen on the watch at the end of the swim. Still it is not the easiest to try and analyse this data on a small screen of an iPhone (even an iPhone 7 Plus), so I was keen to export this onto other platforms. Previous tries at this using RunGap had resulted in strange data in Strava and Garmin (hopefully RunGap devs will fix this); this time I tried HealthFit (Note there will be a post on using HealthFit shortly) and with some discussion with the developer who corrected an issue with the average pace, I got some some great results in the Garmin Connect and SportTracks. Remember that all this data is from the watch in a "start it and forget it" mode, no pressing buttons for laps, end of sets etc - all I did was get in the water and swim. Firstly the less than successful ones: Strava & Training Peaks. - it seems both don't really "get" swimming stats, they have never been good at them, but I include them here for completeness. Strava has a different average pace to all other sites and the original data, and the lap breakdown is minimal. And Training Peaks fails at displaying the data in any meaningful way, though it does associate a swimming TSS score which is handy for building a picture of your overall fitness. Finally we have SportTracks.mobi which is my favourite tool for visualisation of swimming data. It has a nice configurable chart, and a good breakdown of the Intervals. It also has the ability to edit the data, so you could correct the missing 50m kick drill with this if you wanted to. When I first wrote this blog an initial disappointment was that the HR data was not shown on the SportTracks chart, however Aaron the CEO there contacted me for a copy of the FIT file and the support team fixed that as of today (12th Oct, 2017) which if fantastic. This is all server side work, so no need to re-upload any FIT files just go and configure the chart to show HR as I have done below. This is a great way to see how your pace and efficiency relate to your Heart Rate - not something I've ever really seen before for pool swims. What is so cool about this is the fact that I just started the Workout app, chose Pool Swimming and set the pool length to 25m and then left it alone and did my session. From that watchOS 4 and iOS 11 figured the rest out and gave me a great display of data that I can easily export into other platforms for even better visualisation. Good stuff!